It’s fair to say that most Americans have a secret love affair with processed foods. We may not realize it, but we’re unconsciously drawn towards that salty packet of chips, those glistening candy aisles and the pre-packed baked goods in the vending machine. Those of us that live a more conscious life recognize the dangers of eating too many processed foods, and have made it our mission to make the healthier shift back to a whole foods diet. Why shouldn’t your pooch also enjoy a simpler, more wholesome diet? In theory, they’ve only had as much time as us to evolve from their ancestral diet of raw meat and foraged edibles. And that time, estimated at around 30,000 years, arguably isn’t long enough for any animal to thrive on the ultra-processed, synthetic, grain-based food most of us give to our dogs every day. 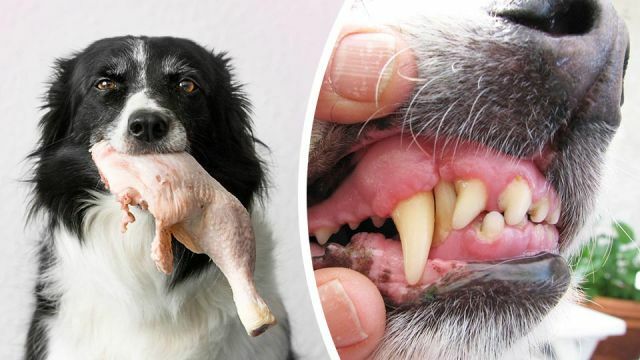 Healthy-savvy dog owners are starting to recognize this, and have started a movement back towards a simpler form of canine eating: specifically, raw meat. But while many dogs seem to literally come alive after switching back to raw meat, casting off inflammatory disease and stubborn health problems, the debate rages on as to whether raw meat truly is the best (and only) thing for our furry friends to be eating. Unfortunately, there’s not a lot of evidence supporting the recent canine movement back to raw meat. And what studies have been conducted don’t paint a promising picture for the pro-raw meat dog diet. A study published this year raised concerns about the safety of feeding raw meat to dogs, having found E. coli on 28 out of 35 commercial frozen raw meat products. Lab analyses also revealed high counts of Listeria, Salmonella, S. cruzi and S. tenella in a high proportion of raw meat products intended for dogs. Other research suggests that the nutritional benefits of a raw meat diet for dogs are minimal, while many raw meat products have been found to be deficient in important nutrients like calcium, potassium, magnesium and zinc. Then there’s the argument that today’s dogs are clearly able to survive on mixed diets that are very similar to the foods that modern humans eat. Some studies even show that street dogs, whose lineage isn’t all that dissimilar to the early dogs of our ancestors, can easily live off waste products. But surviving is one thing: thriving is a completely different ball game. Today’s dogs (including those that freely roam the streets in many third-world cities) suffer from a wide range of health problems, including spinal disease, lipoma, allergic dermatitis, cardiovascular complications, arthritis and cancer. In a study of over 30,000 dogs examined by veterinary practitioners, only seven percent were considered healthy. Those figures suggest that our pooches aren’t doing well on their current diet of grains, synthetic vitamins and unrecognizable processed meats. What’s more, one has to question the credibility of many studies that paint a poor picture around feeding raw meat to dogs. The fact remains that dog food is a billion dollar industry, therefore it’s in the interests of dog food giants like Purina or Hill’s to fund studies discouraging dog owners from switching their pooches to a raw food diet. This potentially explains why there are plenty of studies painting a negative picture around raw meat for dogs, but so few studies showing the positive effects of switching dogs to raw meat. While processed dog food is big money, there’s not a lot of profit to be made from selling raw meat to health-savvy dog owners. Then there’s the fact that studies regarding the bacteriological safety of raw meat-based dog food products are driven by an anthropogenic fear of food-borne pathogens. But dogs aren’t as susceptible to these same pathogens as we are, and in fact their digestive systems are designed to process raw meats far more efficiently than our own. Why should a dog worry about Salmonella or E. coli in their meat, when they typically don’t get sick from these pathogens? Poop that doesn’t smell as bad! It’s important to remember, however, that transitioning your dog over to a raw meat diet shouldn’t take place overnight. A complete and sudden switch from processed kibble to raw meat could shock a dog’s digestive system and probably leave your carpet looking a bit worse for wear (if you know what I mean! ), so gradually introduce more raw meat to your dog over the course of a week or two and see how they respond. Always ensure you use trusted raw meat brands, or only use fresh, completely uncooked meat from the butcher or supermarket. The fresher the meat, the less chance there is of contamination and the better the nutrient profile. And when it comes to a raw meat-based diet, variation is key. Change up the types of meat you feed your dog each day or each meal, and make a point of feeding your dog nutrient-rich organ meats and offal on a regular basis. The closer your dog’s diet is to a “nose to tail” style of eating, the better! Perhaps this is just my personal preference, but if you’re switching your dog over to raw meat, consider supplementing their diet with certain nutritious non-meat foods. Every day, I supplement my dog’s diet with nutrient-dense foods like berries, pastured eggs, bone broth and the occasional whole apple or carrot. The jury is still out on these foods for dogs, but I find my own pooch responds very well to them. Experiment, observe and if in doubt, talk to your vet! Hey Buddy!, I found this information for you: "Is Raw Meat Good For Your Dog? 8 Reasons To Make The Switch". Here is the website link: https://www.thealternativedaily.com/8-reasons-to-feed-dogs-raw-meat. Thank you.